A fun time on Saturday night--taking pictures with these fighting femmes from World Wari II. I just had a terrific weekend. 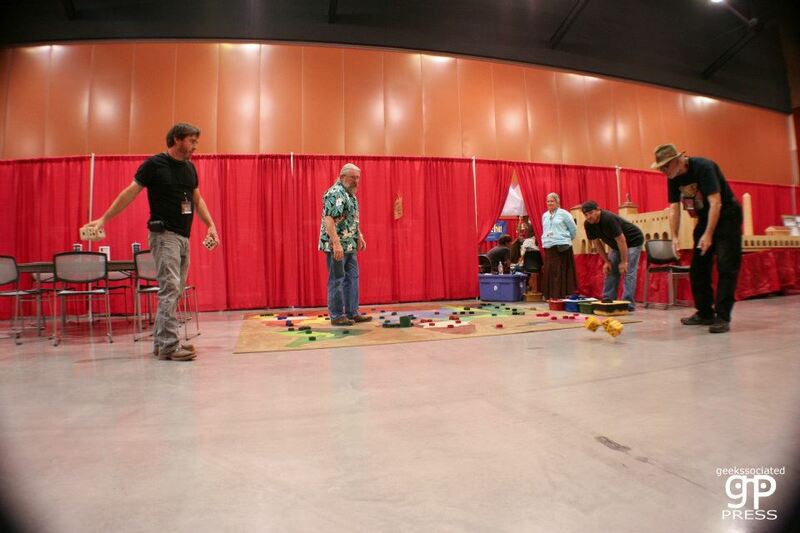 I was a Guest of Honor at VulCon 1, the newest gaming convention to hit the Phoenix scene. The theme was Roman and there was both a hippodrome and a coliseum, not to mention a huge statue of Vulcan, the blacksmith of the Gods, dominating the hall. (However, most of the games were American. ) I brainfaded and did not bring my digital camera on the first day of the Con. I thought of it on the second, and took a few pix, but the best stuff here all came from Tatiana, the Con photographer. I’ll just borrow a few of her pix to show you what fun you missed. Opening ceremonies, I think. I missed this. 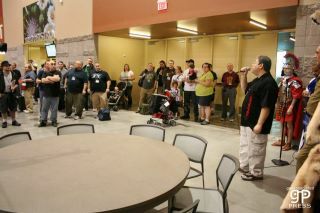 The man with the microphone is Jay Nash, Con Organizer and a good friend of mine. 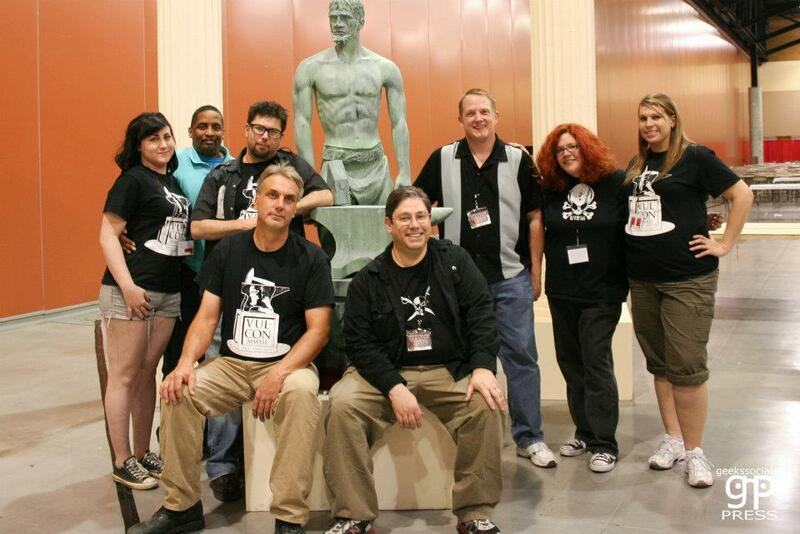 These were the main staff for the Convention. They did a hell of a lot with very few people. 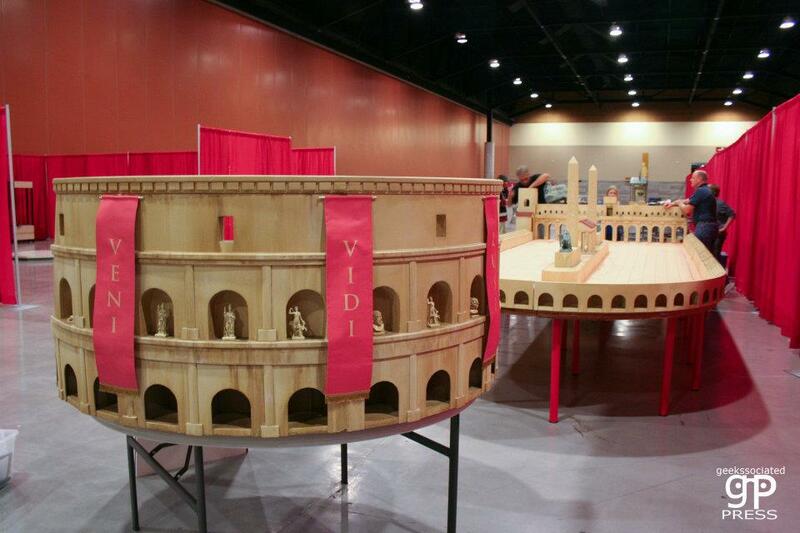 The Con had a Roman theme to it. Here you can see both the Coliseum and the Hippodrome--the two most famous places where real Romans went to the Games. 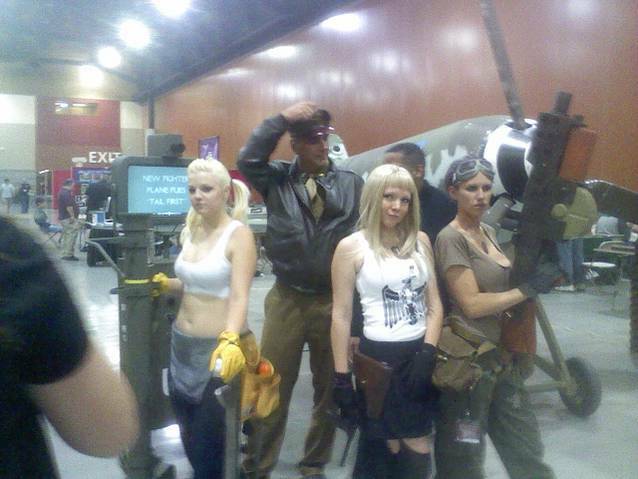 Like most Cons, VulCon had some great cosplay. I would love to own one of these centurion costumes. Although I only played in two games, they were both long and hard-fought, and that’s 2 more than I usually get to play in. Alas, there was not much interest in playing Tunnels and Trolls. So I played Nuclear War and Giant Risk instead. This early in the tournament I hadn't won a thing. People from left to right are Daniel Hernandez, James St. Andre, Ken St. Andre, Trevor X. Not Shown are Chris and Jason taking the photo. The gold anvil belongs to me now. Rick Loomis was number 1 in the Hall of Fame. Guess Who was Number 2. 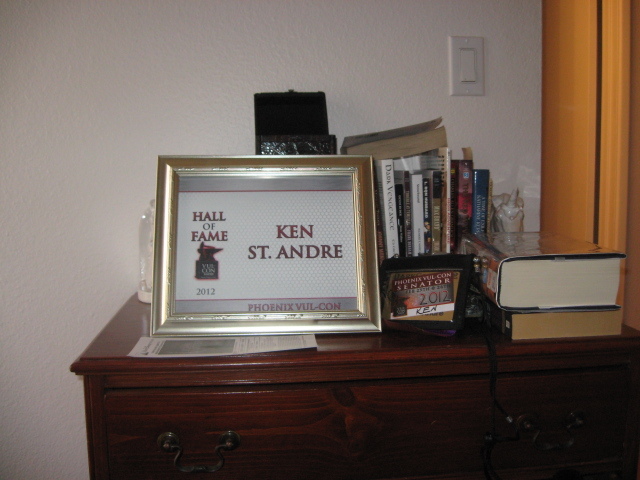 This is the plaque they gave me, taking up a corner of my dresser in my apartment. 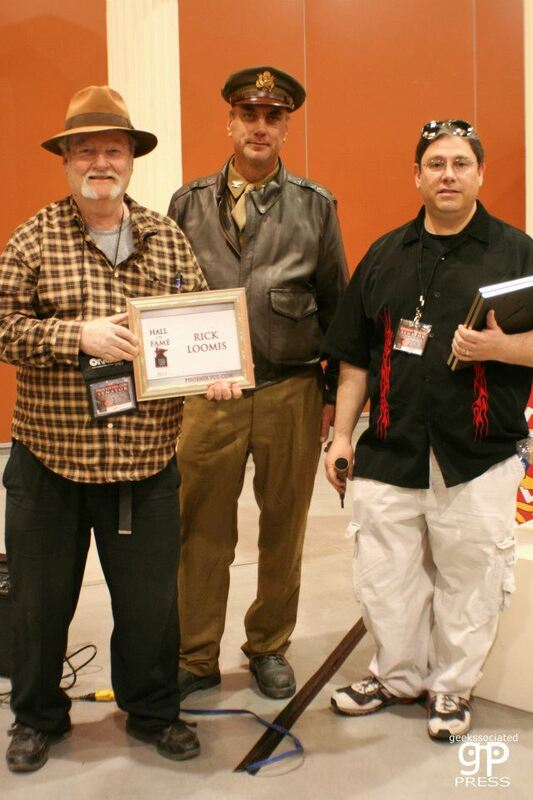 Alan Emrich, who is a war-gaming buff of epic proportions came in third. After the ceremony we all got to meet Vulcan Himself. 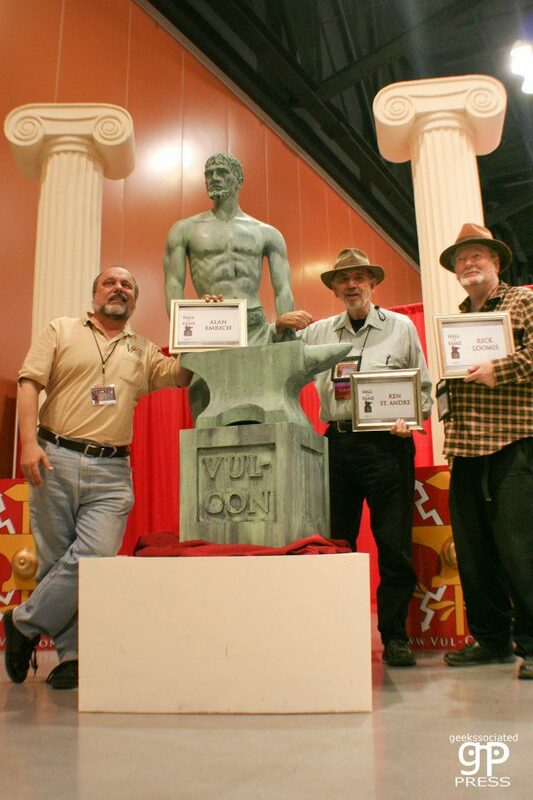 Alan, Vulcan, Ken, and Rick, showing off our trophies at the Forge of VulCon. Sunday wasn’t quite as busy. 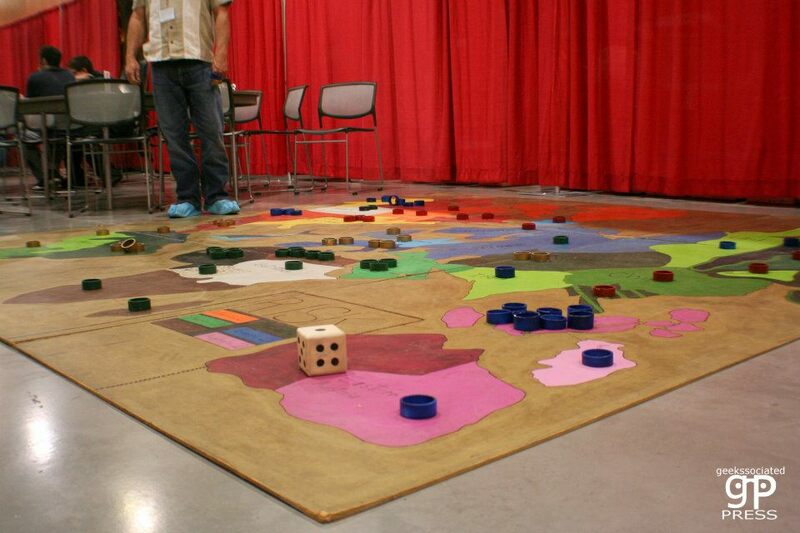 I had hoped to be in a Settlers of Catan tournament Sunday afternoon, but the guy running it was late, so I wound up playing Giant Risk instead. I haven’t played Risk for at least 10 years, so it was a kind of Blast from the Past, and the competition wasn’t really first class, but being good at things means winning the games you ought to win. I won. You really become a world traveler in this version of Risk. Here I am, on the right, busy conquering the world. The guy opposite me was the best other player--I had to take him out first. A lot of other fun things happened, but I need to wrap this blog up, and get it posted. All in all, it was a very good convention for me. I had a great time, and carried off a lot of trophies. My thanks to the convention staff for having me as a Guest, and for putting on such a fun convention. Everyone there seemed to enjoy it a lot. If it comes back again next year, I will definitely go again. 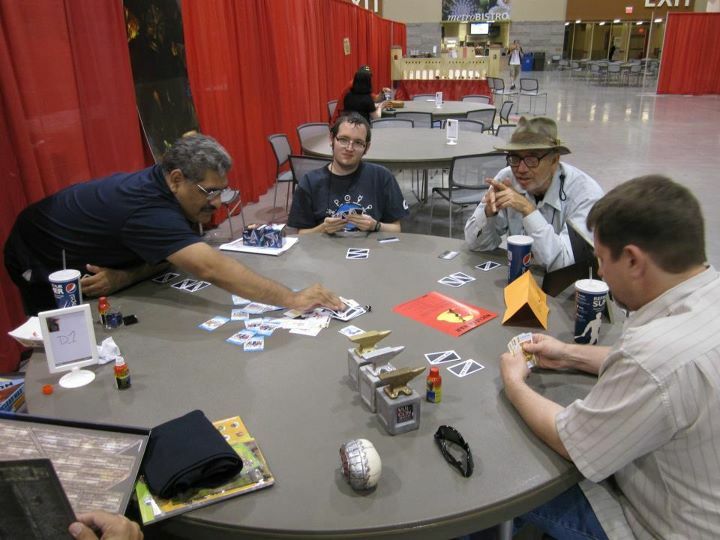 If you’ve gone to any good gaming Cons lately, or if you were at Vul Con, please leave a comment.